After seeing Peter's post on Unfinished Objeects (UFO's)...I figured this would be the perfect time to come clean about a few UFOs I have around here! I cut this silk fabric out before I really learned how to sew! Then I came across the instructions and was a bit intimidated. I definitely want to tackle this before summer! 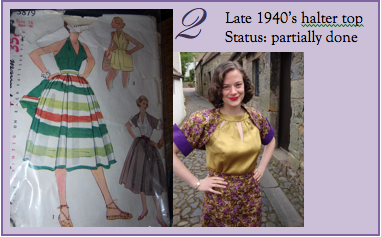 I'm making the halter top in the purple fabric that matches the cuffs of the bolero. Again, it was a project that I ran into a head scratching moment with, put it down and then never picked it back up again! This would be a perfect halter to finish so I can wear it this summer! I have a couple of needlework projects that are UFO's. 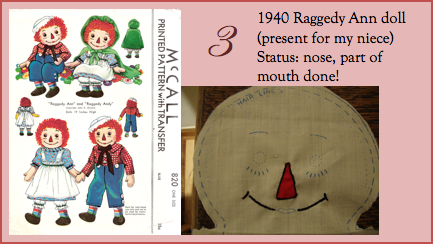 I started this one at christmastime with high hopes of making it for my niece for Christmas! I think I grossly underestimated the amount of time it will take to make the doll and the doll's clothes! Though I definitely still want to do it! This one should be easy peasy but I just need a few extra moments to complete it. I've already finished the dress and at the moment it has mustard yellow collar and cuffs. 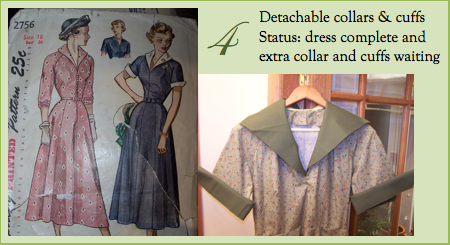 I've got extra collar and cuffs cut out in green (as shown above), deep red and purple! 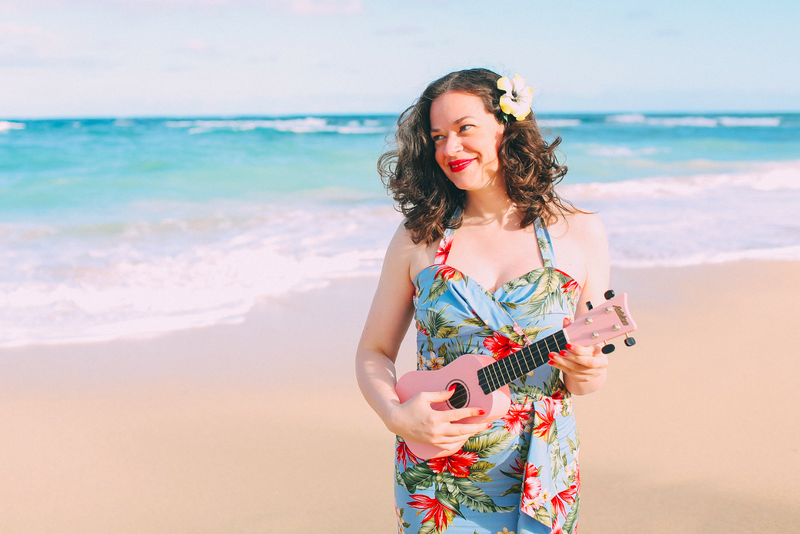 An easy way to switch up the summer dress! Ah, another needlework UFO. I originally started this as a Father's Day present (last year) for my dad. Father's day came and went. Then I thought, well I can make it for his birthday (which was in January). Do you think I'll make it for this father's day? Hmmm.... Cross-stitch takes FOREVER! I think I've easily put in 40 hours already on this and I only have one duck done so far (but it is pretty). I think I may spend some time with these duckies in April and May! I am so eager to finish this suit! Especially as I want to wear it during the spring. The fabric is lovely and I think with a short sleeve blouse underneath I could easily get many more months of wear before summer! It's perfect timing because finishing up one of these UFO's is the theme for the Sew Weekly this week! YAY! I am super excited about this! Which one do you think I'll choose? What about you? Are there any UFO's you want to finish up? 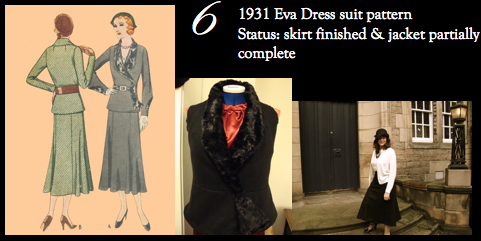 I don't know which one you'll choose, but I would love to see the 1930's Du Barry or the Eva Dress Suit. I only have one UFO - a Simplicity bolero that I made a muslin for but can't decide if I want to make a lined one with the fabric I have picked out. Ooh I vote for the first one - the pattern is fabulous, and that blue silk is amazing! I would love to see it completed. I think Peter hit a raw nerve for many of us. I put the finishing touches on my MPB men's shirt this morning. I also finished a vest I made for my daughter. It has been sitting fully made without buttons for 4 months. Buttons are on and it is packaged for the mail. I also would love to see the blue silk finished. Carry on! The 30s Du Barry is absolutely to die for! It will look so stunning. 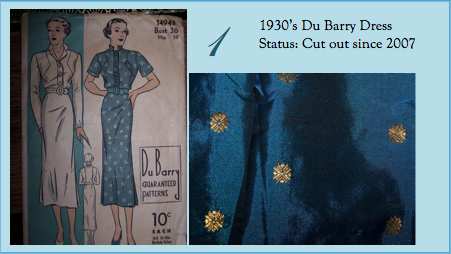 I'm also for the 1930's DuBarry. What wonderful UFO's you have! You MUST finish that DuBarry dress soon, seriously -- I love it. UFOs eh!? I don't know where I've been, but this is the first time I've come across this term in this way! I must admit that I have two unfinished dresses - I blogged about them at the start of the year and I have tasked myself with finishing them in 2011...fingers crossed! Yes, I understand UFOs. I have a few lurking about my sewing room. I do understand that for sure. That first dress fabric is a knockout. love it, it will be amazing for sure. oh yes I have some UFOs, but I'm determined this year to either attack them or salvage the material! I love the top fabric, it's to die for! I have so many UFOs, and a tonne of unstarted but "perfectly formed in my head" projects too! I am so distractible, i hardly ever finish anything straight away. "I just don't do this with sewing at all!" I actually wrote that and then remembered the Amy Butler dress from 2 years ago and the capelet from September(what?) happened and I just took fright and hid them away out of sight - tsk! I have several of these that are on my list, too! Some have been living in bins since last summer, so time to dust them out again! I have a few UFO tucked away started but not completed past a muslin stage. I also have pattern and fabrics paired that never get started I think those count too. Finally if I told you what I paid for barkcloth fabric for making certains in our camper which is now leaking and well I hate to through the money out the window so until we can find some that um repairs airplanes and find out if we can affort to get the repairs done that fabric will stay shelved. Oh good grief, I am scared to do a UFO roundup! Especially as I often have several knitting projects going at once, my UFO list would be huge. I have at least 2 pairs of socks I haven't worked on in ages, a skirt that just needs a buttonhole, pants to hem for my SO, 2 current sweaters and at least a couple buried deep in the craft closet, two embroidered tea towels that haven't been worked on in ages, 2 muslins in the head-scratching stage... I dare not even think of the others!